For other uses, see Ferdinand (disambiguation). Ferdinand is a Germanic name composed of the elements frith "protection" , frið "peace" (PIE pri to love, to make peace) or alternatively farð "journey, travel", Proto-Germanic *farthi, abstract noun from root *far- "to fare, travel" (PIE par "to lead, pass over"), and nanth "courage" or nand "ready, prepared" related to Old High German nendan "to risk, venture." Look up Ferdinand in Wiktionary, the free dictionary. The name was adopted in Romance languages from its use in the Visigothic Kingdom. It is reconstructed as either Gothic Ferdinanths or Frithunanths. It became popular in German-speaking Europe only from the 16th century, with Habsburg rule over Spain. 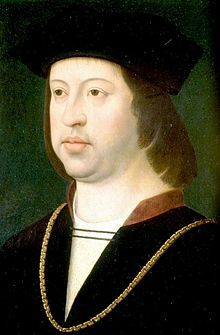 Variants of the name include Fernán, Fernando, Hernando, and Hernán in Spanish, Ferran in Catalan, and Fernando and Fernão in Portuguese. The French forms are Ferrand, Fernand, and Fernandel, and it is Ferdinando and Fernando in Italian. In Hungarian both Ferdinánd and Nándor are used equally. There are numerous hypocorisms or short forms in many languages, such the Finnish Veeti. There is a feminine Spanish, Portuguese and Italian form, Fernanda. Ferdinand II, Archduke of Austria (1529–1595), Governor in the Kingdom of Bohemia in Prague (1547-1567) and sovereign of Tyrol and Further Austria (1564-1595), in Innsbruck since 1567. Ferdinand of Fürstenberg (1626-1683) Prince Bishop of Paderborn and Münster.